In this paper, a novel scanning system for laser diagnostics was developed and characterized. The system is based on the acousto-optic deflection of a high-speed pulsed laser. Results showed that quasi-volumetric laser illumination with high precision and accuracy can be achieved with a simplified and flexible optical setup. 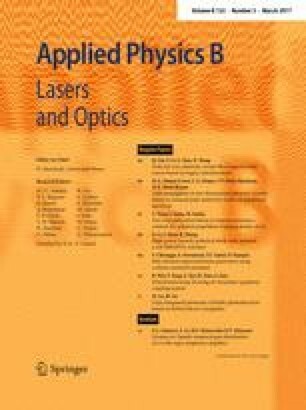 The feasibility of the method for performing high-speed quasi-4D laser diagnostics was demonstrated by the tomographic visualization of a lifted turbulent jet flame using Mie-scattering and multi-plane particle image velocimetry measurements of a turbulent non-reactive mixing case. Three-dimensional flame and flow structures can be detected and tracked with this new scanning system. The authors gratefully acknowledge the support of Ayane Johchi and Johannes Weinkauff. We also gratefully acknowledge financial support by the Excellence Initiative, Darmstadt Graduate School of Excellence Energy Science and Engineering (GSC 1070) and the Deutsche Forschungsgemeinschaft (DFG, German Research Foundation) through SFB-Transregio 129. Andreas Dreizler is grateful for the generous support by the Gottfried Wilhelm Leibniz program of DFG.